It is in the heart of the Okavango Delta that one will find the remote Xugana Island on the edge of the beautiful Xugana Lagoon, assuring a year-round water wilderness experience to our visitors. Xugana Island Lodge is situated on a private concession and takes full advantage of this magnificent site. The Xugana Lagoon is widely accepted as being the most spectacular permanent water site in the entire Okavango Delta, which in the midst of the Kalahari sands, is Africa`s largest and most awe-inspiring oasis. The Okavango River, rises in the highlands of Angola and never reaches the sea; instead its immense waters empty over the sands of the Kalahari. Here the great desert thirst is quenched in a wilderness of fresh water lagoons, channels and islands. It is in the heart of this inland delta that one will find the remote Xugana Island on the edge of the beautiful Xugana Lagoon, assuring a year-round water wilderness experience to our visitors. Xugana Island Lodge is situated on a private concession and takes full advantage of this magnificent site. 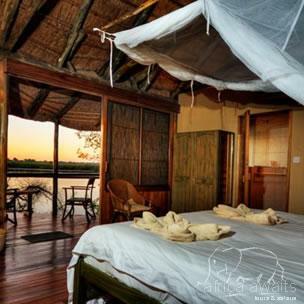 The views from the front of the lodge or one of the lodge’s eight elevated rooms allow for the immediate realization that one has arrived in the heart of the Okavango Delta. 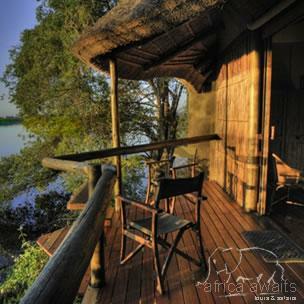 Prepare for the cacophony of bird calls, the distant grunt of hippopotamus and the sweet smell of the well irrigated African bush. The exploration of this part of the Okavango Delta is as exclusive as the base from which one departs to do so, Xugana Island Lodge. Experiencing the sunset across the Xugana lagoon, as viewed from the front of the lodge or from a boat adrift the lagoon will leave memories which will be etched in your mind forever. Daily activities exploring the serpentine waterways, expansive floodplains and wild island networks by boat, mokoro and on foot keep the visitor to Xugana enthralled and entertained. Exploring the Delta by motorboat or canoe (mokoro), combined with walking on surrounding islands in the concession, gives guests the chance to experience a classic Okavango Delta safari. Bird-watching opportunities are outstanding, and fishing for bream and tiger fish is also offered as an activity at the lodge. Xugana Island Lodge has its own private airfield which is located a mere ten minute boat ride from the main lodge area on a neighboring Island. Alternatively Xugana Island Lodge can be reached by means of a scheduled boat transfer system linking Camp Moremi and Camp Okavango. 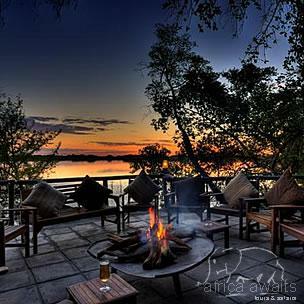 With your holiday, safari or business trip from in to Xugana Island Lodge in Botswana.